This show will contain adult language. Long Form Improv with a Living Room opening. Mostly Montage in form with a few other cutaways included. Typically, the team uses all of the space of the stage and the entirety of the theater when possible. Black Don’t Crack was formed by the common desire to engage in comedic activities and essential oil swaps. Formed at Second City, Hollywood, they realized the need for a unique POV that didn’t rely on tokenism. 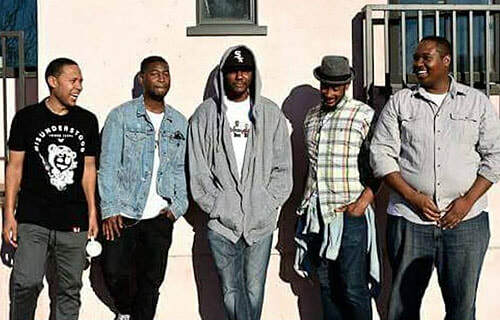 Their mantra: “Keep hope alive, stay black, and can’t we all just get along?” Performing together for 2 years now, the team has developed a voice that is unique and singular to their style. Trained primarily at Second City Hollywood, the members also have extensive experience at UCB LA, Second City Chicago, iO West, and The Groundlings. Black Don't Crack features Adrien Epps, Chris Lewis, Dwight Carter, Kentrell Newton & Nick Bouier.